Restaurant Brands CEO Daniel Schwartz revealed his admiration for Amazon CEO Jeff Bezos in a rare interview with TheStreet. 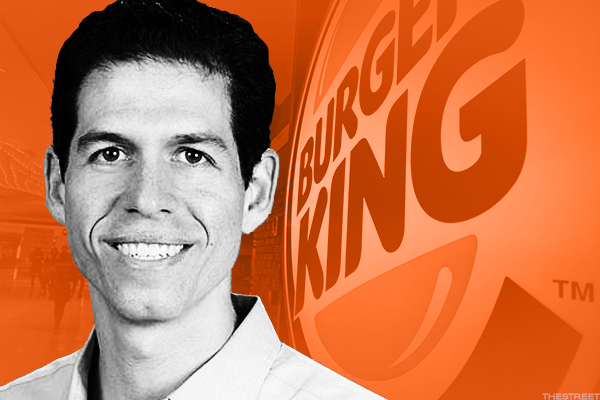 In only his second interview with the press since taking control of Burger King in 2013, Restaurant Brands (QSR - Get Report) CEO Daniel Schwartz revealed his admiration for Jeff Bezos, Amazon (AMZN - Get Report) chairman, president and CEO. Schwartz told TheStreet in a recent it-down interview that he reads Bezos' annual letter to shareholders and this year's, about running Amazon as a "Day 1 company," resonated with him so much that he shared it with his own company. "I talked to our company about that and said 'this is a really incredible story,'" Schwartz said. "It felt close to home for us because we view ourselves as a Day 1 company. We always say we're just getting started. We have this approach that we can be here for the long run. Humility is a characteristic that we look for in the people we hire." In his April letter to shareholders, Bezos said Amazon is a "Day 1 company because it never will reach its full potential - it will always grow. If it were a "Day 2" company, it would be "stasis", followed by irrelevance. Followed by excruciating, painful decline. Followed by death." "The outside world can push you into Day 2 if you won't or can't embrace powerful trends quickly," Bezos said. "If you fight them, you're probably fighting the future. Embrace them and you have a tailwind." Amazon has upended tech and retail, and has oftentimes been blamed for the decline of traditional bricks and mortar rivals, as consumers increasingly shift to online shopping. But, as Bezos seems to see it, maybe traditional retailers killed themselves when they failed to adopt e-commerce. As Barclays analyst Karen Short once told TheStreet, Walmart Stores (WMT - Get Report) is one of the only retailers to have recognized that Amazon was a threat from the beginning and act on it. Many others that have been forced to close massive amounts of stores and file for bankruptcy simply "sat back." Schwartz is a former partner at Brazilian private equity equity firm 3G Capital, which acquired Burger King Holdings for $4 billion in 2010. In its takeover of the burger chain, Schwartz was appointed chief financial officer of Burger King and then CEO in 2013. Under his direction, Burger King purchased Tim Hortons for $11 billion in 2014 - forming the newly combined company, Restaurant Brands. In February, Restaurant Brands added another chain to its portfolio, Popeyes Louisiana Kitchen for $1.8 billion.